Yesterday, I woke up in a motel overlooking the tumbling, turbid waters of the Yellowstone River. To the south and west, national parklands reared up over the little town of Gardiner, Montana. Sagebrush scrub and open grasslands yielded to the steep, still-snowy slopes of Sepulcher Mountain and Electric Peak. I smiled, feeling at peace and at home. I collected my uniform from storage and drove into Yellowstone, crossing into Wyoming within a couple of miles. The route up the hill from the North Entrance toward Mammoth Hot Springs was familiar, but at the same time it felt foreign: it had been nearly two years since last I passed this way. I noticed lots of little things that had changed—a sign had been replaced, a parking area had been realigned—but the landscape and the clusters of people remained the same. Passing through the developed area at Mammoth, with its usual herds of elk and tourists, I continued to ascend past the Upper Terraces. The road wound through the Hoodoos, whose jumbled blocks of fallen travertine are the ghosts of hot springs past. The road hugged a cliff on one side of the narrow chasm between Bunsen Peak and Terrace Mountain as Glen Creek fell away on the other. I caught a brief glimpse of the cascading waters of Rustic Falls before I emerged onto the open plain of Swan Lake Flat. A grizzly sow with her two yearling cubs on Yellowstone’s Swan Lake Flat, with snowy Mt. Holmes in the background. I hadn’t gone another mile before I came upon a tangle of cars. Though some had pulled off the roadway, others were parked any which way, impeding the flow of traffic. Visitors clutching cameras and binoculars stood alongside the road and walked, heedless of traffic, in the middle of the travel lanes. I knew what this meant: there was a bear nearby. I found a safe place to pull off the road and hopped out of my car, a little ways shy of the main cluster of people and vehicles. It didn’t take long to spot what had everyone excited. A grizzly sow and her two yearling cubs were feeding and playing a few hundred yards away. 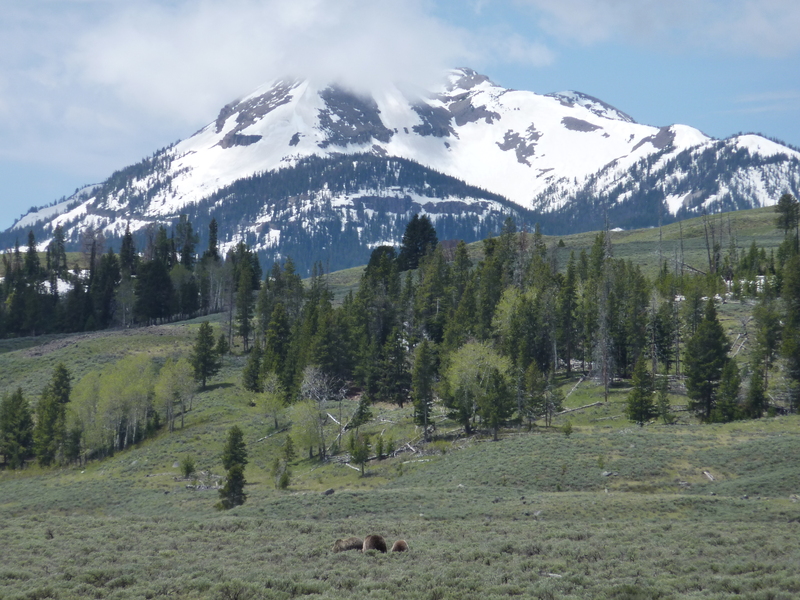 I took a few pictures of the bears, with snow-capped Mt. Holmes as a backdrop, then put my camera away. I quietly stood to watch the bears and listen to the bustling hubbub of my fellow bear-watchers. There were about fifty cars stopped, with around 150 people focusing their attention on the grizzly family. Often, I find the presence of large numbers of other people an intrusion on my experience of wild nature, but today it was part of the fun. The crowds along the roadsides are, after all, a part of the Yellowstone experience. More than that, though, I found that the delighted exclamations, the oohs and ahhs of awe from the crowd, reminded me of what I felt like when I was new to Yellowstone in 2006. Back then, everything about this place was new: safely navigating past the herds of bison and elk that blocked my bicycle commute to work, waking up to falling snow on Memorial Day, securing my trash in bear-resistant dumpsters. The excitement of the visitors at the Swan Lake Flat bear jam, many of whom were seeing a wild grizzly bear for the first–and possibly the only–time in their lives, was contagious. I am reporting to work for my eighth season at Old Faithful. I’ve worked five previous summers for the Park Service as an interpretive ranger, plus an additional two winters in the Yellowstone Association bookstore in the visitor center. The novelty of living with mammals that are a lot larger than I am has long since worn off, but my appreciation of these wild creatures just keeps growing with time. My love for them—and my awareness of what a privilege it is to live among them—has only increased during my time away for graduate school.